Citicoline sodium CAS: 33818-15-4 as known as CDP-choline-Na, CDP-coline, Citicoline sodium, it is a white crystal or crystalline powder, odorless, soluble in water, insoluble in ethanol, acetone, chloroform. Citicoline sodium 33818-15-4 is a derivative of the nucleic acid which is used in the clinical treatment of brain diseases as the best-selling drugs, it plays an important role in the synthesis of lecithin, by promoting the synthesis of lecithin and improve brain function. Experiments show that citicoline sodium can enhance the levels of norepinephrine and dopamine in the central nervous system, thereby treating cerebrovascular disease, traumatic brain injury and cognitive impairment caused by various reasons, and there is no obvious side effects. 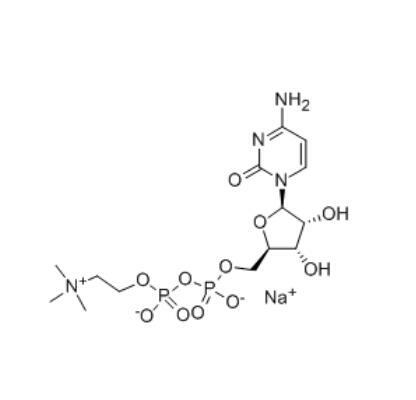 Citicoline sodium CAS 33818-15-4 has purity (Dry content ) more than 99.7%, acid value 6.3 5'-CMP is less than 0.0005, the other largest impurities is less than 0.01. It is the largest selling products in our company with the annual output of over 200 tons, and has passed on site audit by large customers. Looking for ideal Citicoline Sodium Salt 33818-15-4 Manufacturer & supplier ? We have a wide selection at great prices to help you get creative. All the Citicoline Sodium Named CDP-choline-Na CAS 33818-15-4 are quality guaranteed. We are China Origin Factory of Citicoline Sodium Called CDP-coline 33818-15-4. If you have any question, please feel free to contact us.